Trio Country US formé en 1995 et comprenant Marc Beeson (né le 20 décembre 1954), Sonny LeMaire ( né le 16 septembre 1947) & Kurt Howell (né le 15 janvier 1958). 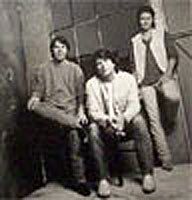 Burnin' Daylight was formed in 1995 by Sonny LeMaire, Kurt Howell, and Marc Beeson. LeMaire was formerly a member of Exile, and Howell Keyboard, Vocalss formerly of Southern Pacific and later a solo artist for Reprise Records both of which were country pop bands in the 1980s. Marc Beeson was a Nashville songwriter who had previously charted a solo single on BNA Records in the early 1990s. The group had originally assumed the name The Loose Cannons, but was forced to change its name to Burnin' Daylight because another band had the same name. Originally, songwriters Trey Bruce and Rob Crosby were slated to be members of Burnin' Daylight as well. However, they decided to focus on their respective solo careers instead. Initially, Burnin' Daylight was intended to be only a live band. They eventually sent a tape to Mike Curb, head of the Curb Records label, who signed the group in 1997. In April of that year, Burnin' Daylight released its eponymous debut album. They charted three singles on the Billboard country music charts, including a Top 40 hit in "Say Yes". Since disbanding in 1997, former bass guitarist Sonny LeMaire has written several singles for other artists, including the Number One hit "Beautiful Mess" by Diamond Rio, "She Thinks She Needs Me" by Andy Griggs, and "Fall" by Clay Walker (also recorded by Kimberley Locke). All of these were collaborations with Shane Minor and Clay Mills. LeMaire has also since reunited with Exile.